Steve Wynn has stepped down of the company he founded, and a tech agency has revealed its new global branding. Scroll down for all the news communications pros need to know on Wednesday morning. 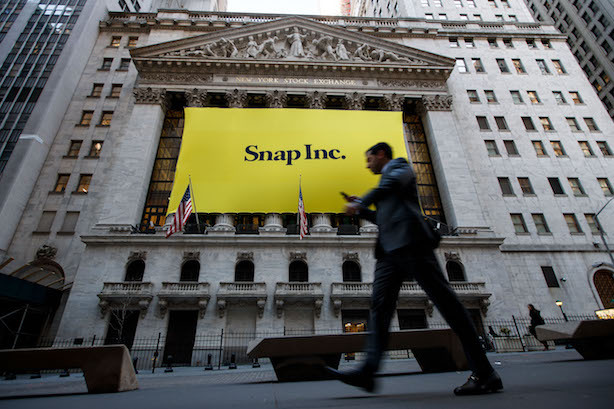 Good news if you held on to shares of Snap. The company finally beat analysts’ expectations after the bell closed on Tuesday with sales of $285.7 million in the fourth quarter, $30 million more than expectations (MarketWatch). Snap shares were up 25% in after-hours trading (The Verge). New from PRWeek this morning: Cohn & Wolfe tech-focused shop Axicom has revealed new global branding, trading in red and black for lighter colors. The firm said the rethink is not related to the recent exit of CEO Cathy Pittham. Next Fifteen has made its first acquisition of the year: U.K. digital agency Brandwidth Group. Casino mogul Steve Wynn has stepped down as the CEO of Wynn Resorts after several allegations of sexual harassment against him were unearthed last month by The Wall Street Journal. Wynn has denied the allegations, blaming an "avalanche of negative publicity" as he resigned (CNN). Wall Street could be in for another roller coaster ride today. Dow futures are predicting a drop of more than 200 points at the opening bell. Trading on Tuesday also began with a significant drop before rebounding to finish up 567 points at the close of trading (CNBC). Ever plan a press conference only to cancel it at the last minute? Then you can relate to the PR staff of the Indianapolis Colts. New England Patriots offensive coordinator Josh McDaniels reportedly agreed to contract terms to become the new head coach of the team, only to return to the Patriots before signing a contract. The Colts were set to introduce McDaniels to the media on Wednesday (ESPN).